I didn't get this immediately. But if you look closely, you'll see the snowboarder jumped over the fold in the newspaper. I know most people don't actually study ads but that's ok, as comprehension is there I think. What I mean is even if you don't pick up the clever part, you still know it's an ad about snowboarding / skiing. 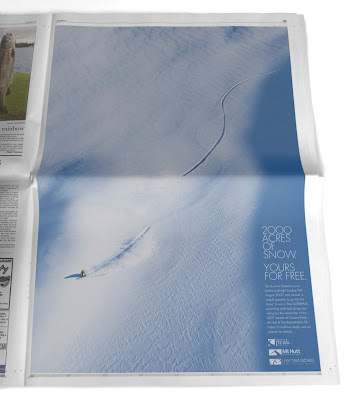 And if you are into snowboarding and notice the jump over the fold, you get more out of the ad.